When reflux (heartburn) occurs, Refluxin ensures that the lower oesophagus is bathed in a mildly alkaline mucoprotective coating that forms a physical and neutralising barrier against irritating gastric acids. 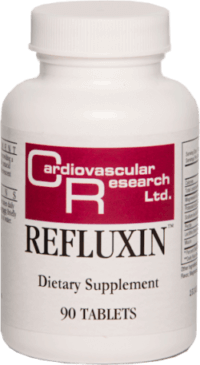 Refluxin contains a combination of proven and effective mucoprotective and alkalinising agents in a pleasant tasting, slightly effervescent fructose-glucose-citric acid base. Up to five tablets may be taken at any one time. The mucoprotective agents (pectin, mucin, lecithin) not only form a physical barrier against gastric irritants, they also possess mildly anti-inflammatory and anti-oxidant properties which may help to interrupt the adverse effects of chronic inflammation on lower oesophageal sphincter tone. Compared with common antacid preparations, Refluxin contains only small amounts of alkalinising agents (sodium bicarbonate, potassium bicarbonate, magnesium carbonate). The primary function of these agents is to form a protective foamy raft layer and provide antacid effects on upper gastric and lower oesophageal mucosal surfaces. Because Refluxin does not neutralise gastric acid appreciably (compared with standard antacids, acid reducing histamine and proton pump inhibitors), it does not interfere with important digestive and anti-microbial functions of stomach acid. It also avoids the potential problems posed by treating heartburn with systemic pharmaceutical medicines, which may have unwanted negative side effects. Refluxin does not contain aluminium in any form. Mucoprotective agents: Pectin, mucin, lecithin. Alkalising agents: Sodium bicarbonate, potassium bicarbonate, magnesium carbonate.